Auditioning teaches you how to prepare yourself. You cannot expect to just stand up, sight-read a piece, and earn a solo. That’s just not how it works. Singing by oneself is a completely different experience than singing as part of a group, and it needs to be prepared differently. In much the same way one prepares for a work interview, or a presentation at a conference, one must prepare a piece for audition, considering tone quality, intonation, and projection, as well as presentation, and emotive qualities. These are all essential life skills! A certain level of emotionality is expected during an audition. Music is after all, a highly emotional pursuit, and singers are expected to emote while they perform. Still, emotions like nervousness, fear, and anxiety are all common when getting up to do an audition. Learning how to manage these emotions is not only an essential skill for singing, but is an important life skill. How choristers handle these emotions, are as unique as the choristers themselves, and no one way will work for every singer. Learning what works best for you, and for your audition is best. Confidence is important, and it’s not like a switch that you can turn on or off. Confidence is built upon, layer by layer, and experience by experience. Knowing that you are able to do something, and do it well, is a learned behavior. It starts by first taking a chance, preparing and managing yourself well, and then analyzing not only how you could make it better next time, but acknowledging what you did well! By accumulating these experiences, and by having the respect and support of your fellow choristers, your confidence will grow! 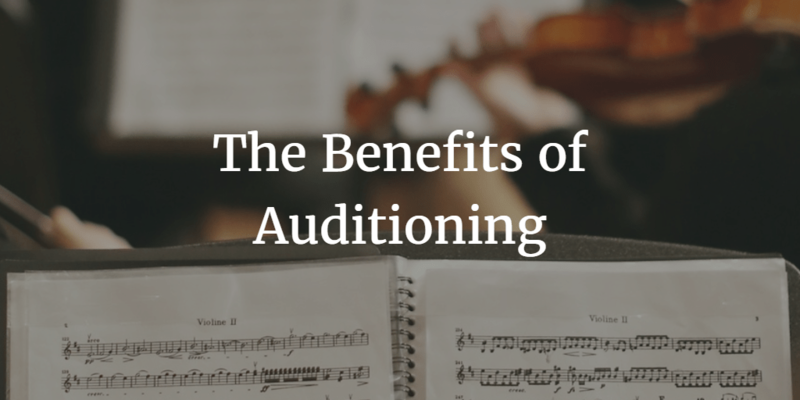 How else can auditioning benefit you? Tell us in the comments below!